Important Note: Kage are not the only ones capable of giving out missions. Jounin can hand out missions up to Rank A [S under village stress or breach of protection] given the circumstances. Tokujou can hand out missions up to Rank B. Remember, even if the mission was not assigned by the Kage or Village Leader, he/she must still give permission (through PM, etc. etc. whatever way the person can be contacted). based on the mission's possible danger or level of importance. than others, as Sunagakure would choose accomplishing missions over the lives of their comrades, Iwagakure would follow orders even if it means death and Konohagakure's Shinobi Rules #4 states that "A shinobi must always put the mission first". assigned to genin fresh from the Academy. is between five thousand and fifty thousand ryō. mission is between 150 thousand and 200 thousand ryō. They can be found here [Click]. E-C rank missions can be NPC missions or PC missions. But for strictly NPC missions they require a post count. SS - Plot and other staff generated missions or approvals missions. There will be a large chance of death/maiming and people who are foolish enough to attempt these at low levels (Genin/Chuunin) will have any stipulations of killing removed. People should be smart enough to know this, thus in these topic's/missions there will be a suspension upon NPC's unable to kill.Only Staff and Unique NPC participants are allowed to create these missions. NOTE: For S/SS ranked missions, I mean Unique NPC's created by staff and/or played by jounins depending on approval. As I said, death may/can happen in these missions, so we want to be clear on that about genin's and chuunins who think they have immunity. - PC-Missions (player-character missions) may be stacked up to a maximum of 5. NPC-Missions (non-player-character missions) may be stacked up to 7. - For PC-Missions, S and SS ranked Missions are non stackable. A-rank missions may only be stacked with C and D-rank missions. B-rank missions may be stacked with only B, C, and D-rank missions. C and D-ranks may be stacked at will, in accordance to previously stated rules. - NPC-Missions must follow the post count for each mission done. That means, if you take 3 C-ranks, you must do the Post-Count for each mission as if you were doing them individually. - PC-Missions can meet half of the Word-Count or Post-Count for each mission taken. - Word-Count's/Post-Count's may be dropped in the event that the mission is a plot-related mission, is integral to the safety of the village, or is part of a time-sensitive event. Dropping may only occur for PC-Missions. Weekly pay is given to the upper tier Shinobi. As your rank increases, so does your responsibility. So, if you fulfill your responsibilities, you get paid for it. If you aren't fulfilling them, you won't get paid for it. Weekly pay updates have to be approved in the Character Updates thread or you do not receive them. 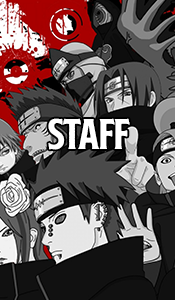 Shinobi that fall under the weekly pay system are paid every Friday. When posting the pay update in your Character update, please give the date of that Friday that you wish to be paid on so that we can check and make sure that you deserve pay. If you do not follow that and do not include a date, you will not get paid. Conditions: Active Active Active. You have to Actively be leading your village. This does not mean you have to be cooped up in an office always giving missions. But, you shouldn't go inactive either and only show up for pay day. Conditions: Active Active. The ANBU Leader serves as the substitute Kage if the Kage ever goes on absence. As an ANBU Leader, You are able to create missions up to S-rank. This is only a title position, its not a rank. This does not mean you have to be cooped up in secret lair or location always giving missions. But, you shouldn't go inactive either and only show up for pay day. Conditions: Either you have students and actively lead them, or you are a beneficial part of your village. * - Missions must be completed by [12:00am PST / 3:00am EST] the day of the ending pay period. If they are not, the mission is added to the next pay period. SORRY, NO RETRO/BACK PAY. EVERY VILLAGE'S PAY STARTS FROM NOW ON. These facilities allow medical ninjas to analyze unique poisons, and create unique antidotes. They also allow transplants to be made within them, with maximum safety. Last but not least, these medical facilities may allow someone who has been severely wounded to recover from what could have been a deadly wound. Note: Without this facility, NO TRANSPLANTS, NO ANALYZING UNIQUE POISONS AND NO PEOPLE GOING TO THE HOSPITAL. Warns the Shinobi of the Villages when a non-wanted person enters their lands. Makes it hard to sneak into adjacent lands without proper Jutsus to conceal oneself. Allow Shinobi of the village to intercept without leaving through the Gates. This acts as a quick interception system. However, They must arrive at the location with a logical reason to be there. Can have a radio tower on top of the watch towers to give the Radio item a boost. Lets one call in reinforcements quickly if they have the Radio equipment item. B-Rank- 15 Million Ryo and only covers the Village itself. S-Rank- 7.5 Million Ryo in addition to the two previous amounts and covers the entire country of land. The Village spend time on making a training ground that will truly test their Shinobi. Anyone training in the training ground can receive a benefit. The training ground bonus can be stacked on the plus 10 that Genin get with training with a Sensei. Villages that put a lot time in the training grounds are known for having Shinobi that possess a bunch of different Justus. The villages have great blacksmiths that grasp of knowledge of making weapons that require less material making it cheaper on those who need weapons & equipment. B-Rank- 10 Million Ryo, Give a 10% discount price on custom weapons and equipment. A-Rank- 15 Million Ryo in addition to the previous amount paid, Give a 20% discount price on custom weapons and equipment. S-Rank- 20 Million Ryo in addition to the previous amount paid, Give a 30% discount price on custom weapons and equipment. The Villages have excellent places to eat that raise morale and replenish the chakra of those after combat and training. The chefs are renowned in the kitchen for making the best meals in their respective country. 5,000 Ryo Allows a shinobi to replenish their charka in 1 post instead of waiting around with 5 post. (200 words minimum) The deduction must be made as an update and included in the user's update thread to be valid. Wall Protection allows the walls of the village to be infused with element chakra. This makes it super hard for anyone to use the walls to enter the village. This will mainly force those to come through the gates instead of sneaking over walls. The wall is sophisticated enough to recognize the chakra of those that belong in the village. The element chakra has the power of a B-rank Jutsu each time it's activated. For 20 Million Ryo, the Kage will dictate what type of element chakra is infused with the wall. Normally it will be one of the elements that the Kage themselves possess. The village Academy is a place to train, and obtain new, stronger and more unique ninja. Aside from the obvious lessons one would learn from a Ninja Academy, all students receive essential knowledge, such as reading, writing, mathematics, science, geography, etc. Students also have to study the Shinobi Rules. Special lectures read by highly experienced shinobi are sometimes held. Taught by chūnin instructors, all ninja potentials are lectured on tactics and strategies. They are instructed on the basics of trap-setting as well as how to strengthen their minds and bodies. They are taken through the handling of ninja weapons and tools, like shuriken and kunai, learning how to throw and wield them through target practice. Academy students are also taught about chakra and how to use it, hand seals and the basic levels of, Nin, Tai, Gen.
9 Million Ryu -- All new genin can a bonus of 50 exp to spend. 5 Million Ryu -- In addition to the 50 exp to spend, all genin automatically know 1 D rank move chosen by the kage. 6 Million Ryu - In addition to the previous mentioned bonus, all genin automatically learn one C rank move chosen by the kage. Banks are a integral part of the village. Each village gets its own, and each village has a unique bank. Banks are a individual entity in the village, they are secure and safe for the most part. Should a Ninja try and rob the bank, the village will be alerted and can respond. But villages are prevented from setting up defenses in/around the bank, as its a privilege not a right for the village to have one. Basic Bank - 4 Million Ryu. Keeps safe villages money and ninjas money and items should they choose to store it in the bank. Village Wide Bank - 8 Million Ryu. Grants 10% interest each MONTH to the village and ninja who store there ryu there. Has one B rank NPC guard. State Bank of ____ - 5 Million Ryu. The State bank of the village, grants 20% interest each month to the village and ninja who store there ryu there. Has two A rank NPC guards there. Subject: Re: Missions and Money!